Many people visit Thailand for a variety of reasons, but one of the best extreme sports to engage in while here is the surfing that takes place along much of the Thai coast. While surfing is generally good throughout the entire country, there are a few areas that have optimal conditions for waves and surf. In this list, I’ve outlined which beaches in particular are the best places to visit for particular types of surfing while in the country. Located just a stone’s throw from Phuket, Nai Harn Beach sits at the southern tip of a peninsula and is also one of the most western landlocked points in Thailand. The swell around the beach varies from half a meter to about three meters and the wind is also quite variable. Best for beginners and intermediate surfers, Nai Harn has a beach break at its southern end and reefs and beaches at its northern end, which help produce the stellar surfing conditions. About twenty kilometers north of Nai Harn is Kata Noi Beach, which for many beginners is the perfect beach. 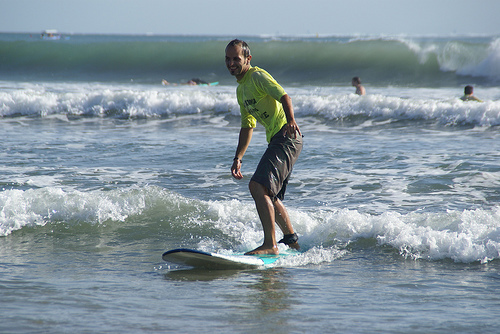 The swell here is a little bit smaller, ranging from half a meter to two meters. The beach is the standard wave and surf breaker while winds run across this beach from the south-east to the north-west. Most of the surfable waves in this area can be found off of the northern headland and the waves can come really fast during some parts of the day. This beach is a bit farther north from Kata Noi and is primarily for those who have an established background in surfing. Here, the swells can grow to be as large as four meters but the shallow coral reef in the vicinity makes it a great surfing spot as it reduces the intensity of larger waves. The area may be a little crowded during the high season but most people are friendly. On the south side of the beach, the reefs are higher and it is advised to “surf to the left” when coming in. Another fifteen minutes north of Kalim Beach is Kamala Beach, an area that can accommodate all levels of surfers. The variable winds and changing tides make this an interesting place to surf anytime of the year. For experienced surfers, there is a point break and some of the best surfing goes on around here when it’s low tide and the surf is under one meter. While this area is an expert’s dream, on calmer days you can find the perfect conditions for beginners to practice. Last on the list is Surin Beach, a professional’s beach that demands the very best of those who wish to ride the waves. While the swells here are relatively small at two meters, the waves themselves are heavier and when the waves do get big occasionally, they are a force to be reckoned with. The sandy bottom is a good cushion for the feet and occasionally, the body during an intense wave and wipeout. There is minimal wind here but watch out for a large section of rocks in the water near the middle of the beach. This entry was posted in Asia, Surfing, Travel, Water Sports and tagged Surfing, Thailand. Bookmark the permalink.